The FDA approval of inotuzumab ozogamicin marks the availability of a new targeted therapy with a CD22-directed antibody drug conjugate that may improve outcomes for patients with relapsed or refractory B-cell precursor ALL, a rapidly progressing type of cancer. In the INO-VATE ALL clinical trial, a significantly greater percentage of patients who received inotuzumab ozogamicin achieved complete remission compared with patients who received chemotherapy. 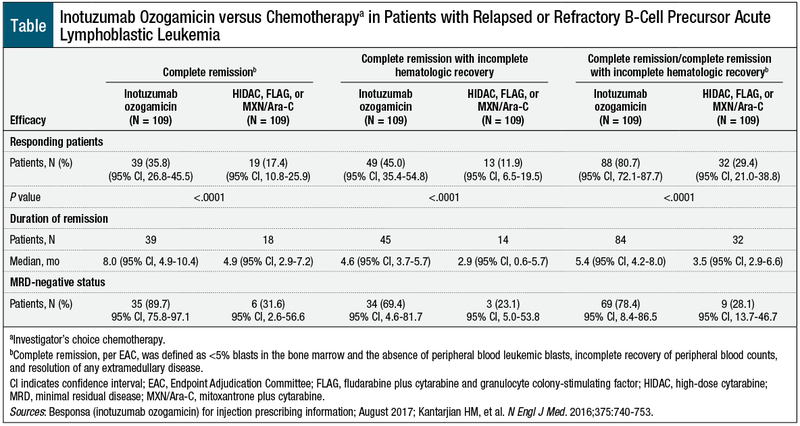 Furthermore, the median duration of remission and the rate of MRD-negative status were greater with inotuzumab ozogamicin versus with chemotherapy. 1. Mayo Clinic. Acute lymphocytic leukemia. www.mayoclinic.org/diseases-conditions/acute-lymphocytic-leukemia/basics/definition/con-20042915. Accessed November 28, 2017. 2. National Cancer Institute. SEER cancer stat facts: leukemia – acute lymphocytic leukemia (ALL). https://seer.cancer.gov/statfacts/html/alyl.html. Accessed November 28, 2017. 3. US Food and Drug Administration. FDA approves new treatment for adults with relapsed or refractory acute lymphoblastic leukemia. August 17, 2017. www.fda.gov/NewsEvents/Newsroom/PressAnnouncements/ucm572131.htm. Accessed November 22, 2017. 4. Besponsa (inotuzumab ozogamicin) for injection [prescribing information]. Philadelphia, PA: Pfizer; August 2017. 5. Kantarjian HM, DeAngelo DJ, Stelljes M, et al. Inotuzumab ozogamicin versus standard therapy for acute lymphoblastic leukemia. N Engl J Med. 2016;375:740-753.